There was more to it after some technical details. We were told (or I imagine ‘setters’ were told) in an evangelical tone, that the editors ‘hope to demonstrate and encourage’ whatever the omitted letters in 12 solutions spelled out for us. Well, I shouldn’t imagine the esoteric coteries of editors ever descend to read the blogs that the rank and file, the grassroots, hoi polloi, riff-raff, rag-tag, vulgar commonality of bloggers compile each week, so here goes. I didn’t really need to check through the surface reading to confirm that these two had membership of the Tipsy Listener Setters’ Coterie (at least one of them was still in the bar when I left at about 4 a.m. after the Listener Setters’ Dinner this year). Ye gods, there it was, ‘Prohibition is what fills a bath with rum, essentially (4)’ (TABU but I had a bit of trouble with the wordplay BAT fills (a)BAT(h) and U is (r)U(m) essentially but did that RUM act as an anagram indicator too? My solution seemed to say BATU). So there they were swilling down bathfulls of the hard stuff and we had ‘Red shifts (3)’ too ([H]ERD) and, to conceal all that mixed imbibing, the bottles were ultimately thrown away, ‘Let children throw bottles (4)’ (RENT hidden). We had spotted that clue lengths didn’t agree with grid lights in twelve cases and we focussed on those as ’12 answers’ that ‘have a common definition’ (COMMON indeed – the effrontery of it!) That clue that led to ERD, happily gave us our essential break-through after only a few minutes of solving. (Is this the regime we are being coached in? Easy clues, early p.d.m.s?) It tied in with the preamble and my triumphant cry of ‘The common HERD, that’s us!’ led to a fairly rapid gridfill as we located COMMONALITY, HOI POLLOI, GRASSROOTS, THE MASSES, RABBLE ROUT, CANAILLE, RUCK, MULTITUDE, THIRD ESTATE, RIFFRAFF and VULGUS. Like this? Well it had a delightful aspect. Long after mine had been mailed, a fellow solver said ‘ESOTERIC’ (Chambers says, ‘Inner, secret, mysterious, taught to a select few’) ‘well, I suppose the Listener image is that!’ ‘Esoteric?’ I rejoined, ‘My inner circles contained the word COTERIE! (Chambers says, ‘A social, literary or other exclusive circle). Nice one, Tibea! That wasn’t the only aspect that earned Numpty nods of approval. There was a superb range of clue types. 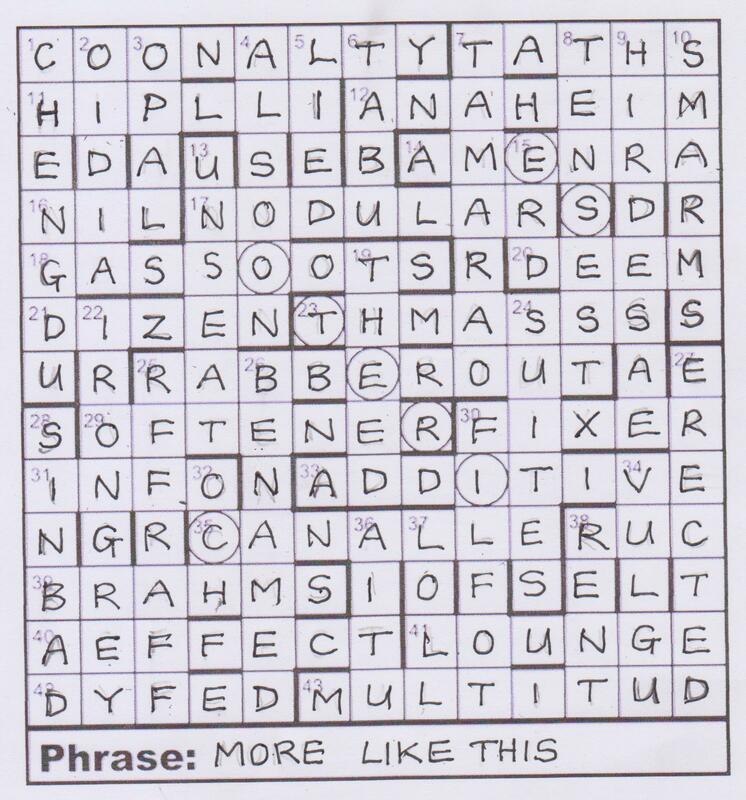 We had the proper nouns AMENRA, ANAHEIM, BRAHMS, DYFED and SINBAD (what a gem of a clue ‘Evil, evil, Arabian adventurer’), the classical references in OIDIA, HOI POLLOI, and the HS (HOC SENSU) of that difficult TATHS clue, a bit of Spenser (of course!) in THEED and ALSOON and a fair spattering of anagrams to get us going and clues using subtraction, reversal and alternate letters. There wasn’t an imbalance of any clue type. Was there any unfairness? Am I allowed to complain about a comma? If I had written that clue ‘Built in, with one side turning to the other (7)’ (ELECTED with L changing to R), the late Radix who so kindly coached so many of us, would have said ‘Remove that deceptive comma – if you have one there, you have to have one after ‘Built’ too!’ Now that is effrontery, complaining about the coterie’s commas, so I had better get my coat! Great fun, thanks, Tibea. Let’s have more like that! This entry was posted on 2 May 2014 at 4:00 pm	and is filed under Solving Blogs. Tagged: by Tibea, Popularity Contest. You can follow any responses to this entry through the RSS 2.0 feed. You can leave a response, or trackback from your own site. Ah, and I wasn’t happy with TABU either but sent it, so that’s the end of my run this year! Ah well, it eases the stress! I did laugh at you and George, Dave!